Is your thumb less green and more like Agent Orange when it comes to houseplants? Would you like to have a stunningly gorgeous and original piece of art-work, instead of a dead plant, displayed in your living room, office, den or even bedroom? Do you have a bit of love for the summer-camp arts and crafts class? 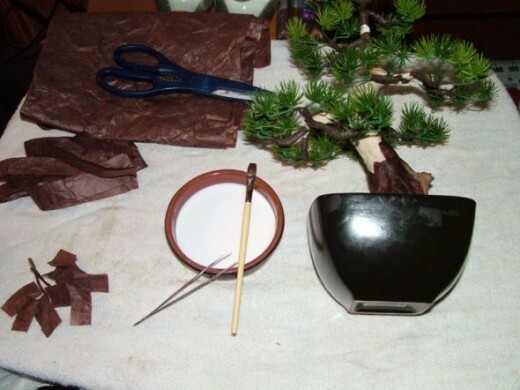 With a little time, patience and depending on skill, you can make your very own Bonsai tree. There are a lot of small things to get, but the total costs are usually less than $60.00 to make at least one tree (and probably several). 6. A place to work about 4 feet by two feet. 7. A steak knife (To cut Styrofoam). 1. Paper towels (the cheap stuff works fine). 2. Elmer's Glue (Or any white, clear-drying, water-based glue). 3. 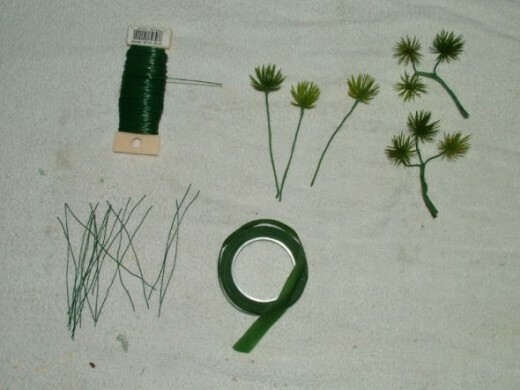 1 package of thick florist stem wire (about 18 inches long). 5. 1 Evergreen "Spray" (Plastic evergreen bunches, see photo - available at Michael's). 6. 1 pound of Basic Modeling Clay (Gray is fine, brown, black or other colors as well). May need more depending on the size of the tree. 10. Florist tape (the self-sticking brown or green stuff). Each Bonsai tree is unique, so making the exact same tree over and over, or even once is a bit much. In MAKING a Bonsai tree, there are several things to consider. What kind of a tree do I want to make? What is available that can be used for a Bonsai tree? The "sprays", or greenery, the piece of a real tree (usually a small piece of a branch or even driftwood that looks vaguely "tree-like" or can be incorporated into the trunk of the tree) and the bark all combine to make a whole tree. Selecting your materials, the texture, the color and the shapes are all important to designing the tree and is limited only to your imagination. It's suggested, however, to find a picture of a tree much like the one you want to craft and work from that as a general template. The colors, textures and, to a lesser extent, the shape can be used to select your supplies. Another consideration in designing your tree is the size. Your bowl should fit the tree or be appropriate for the size. Too small of a bowl is a bit better than too big, but either is alright if that's what you want. Keep in mind, though, that a Bonsai doesn't look like a twig growing in a planter, but looks like a fully mature tree growing in a bowl that seems almost too small to hold it. For example, in creating the tree in the photograph above, I found several branches in a fire-burned area that had been stripped of bark, looked weathered and could be cut to size to incorporate into a Bonsai. But it was a bit bleached. Some light wood stain helps bring out the wood color without putting on an artificial gloss. Once I had the size of my wood piece, I selected the sprays. These are the "Greenery" or the leaves and are more a matter of taste than necessity. I prefer 'evergreen' trees and based my model on that. If you want to try something else, please don't hesitate to do so. The basic techniques described later can be used for a variety of trees. Just keep in mind that the more 'leaves' it has, the more work it will be. You have to put it all in something so I got the bowls next. I wanted a 1/3 ratio of tree to bowl. The wood piece must be SMALLER than that, because it's only part of the tree and doesn't comprise the whole base of the tree. The $2.99 bowl from Walmart was black outside, red inside and had a vaguely 'Oriental' flavor that seemed to work. Bark is actually tissue paper or Amate paper. I recommend the Amate paper once you're comfortable with the tissue paper, but either can be used from the start. Tissue paper is a bit easier to work with. The color should be complimentary with the greenery AND the tape being used to wrap it up. If you have more green than brown in your color for the bark, use the green florist tape. If a different color, try the brown. The idea is to make your tree look natural. There are few unusual color combinations in most trees. Assemble all of your materials at your work-station and prepare to be creative. A Bonsai tree is grown. This one we have to make. And each part of the Bonsai tree is made by hand. To start, select an odd number of the thick florist stem wires. These will become part of the trunk and all of the branches of your tree. An odd number of branches is an Asian tradition and is expected in a Bonsai. IT IS NOT MANDATORY. If the greenery in your tree design actually hides the branches, you only need enough branches to complete the tree. Next, using the scissors or, as I use, a paper cutter, cut the paper towels into strips between three quarters and one inch wide. You'll be wrapping these around the wire. The thickness of the branches you have depends on the tightness of the wrap and the thickness of the paper towel. You may have to experiment a bit. Wrap at a 45 degree angle relative to the wire (less angle for thicker branches, more angle for thinner ones) to start, then gently roll the wire, letting the paper towel wrap around the wire and guiding the angle and tension as you go. Take your time. They don't need to be PERFECT, but they do need to keep from letting any wire show and add some bulk to it. Try to taper the wrap so that one end is thicker than the other and wrap the whole wire. Secure the ends with florist tape to keep the paper towel from unraveling. If you have a lot of branches in your tree design, each one must be a separate wire. Each wire must be wrapped individually (you'll understand later). The most I've done is 15, but the number is up to you. So now that you have branches, the greenery is next. What you use depends on how you proceed, but you will need to do some preparation on the greenery before proceeding. In the example I'm giving, I used an evergreen spray I found at Michael's. I removed the 'buds' from the spray, leaving a needle-pine-like blossom. There were two colors of these buds so I separated them by color. Lighter ones indicate 'young' or newly sprouted buds. Darker ones are the more mature ones. This helps reinforce the notion that your Bonsai isn't fake, even if it is. Next, I trimmed any extra plastic or flashing from the buds I was to use. Real trees don't have them. Whatever you're using for your greenery, try to ensure it looks 'real' from close up. That way it will look real from far away as well. 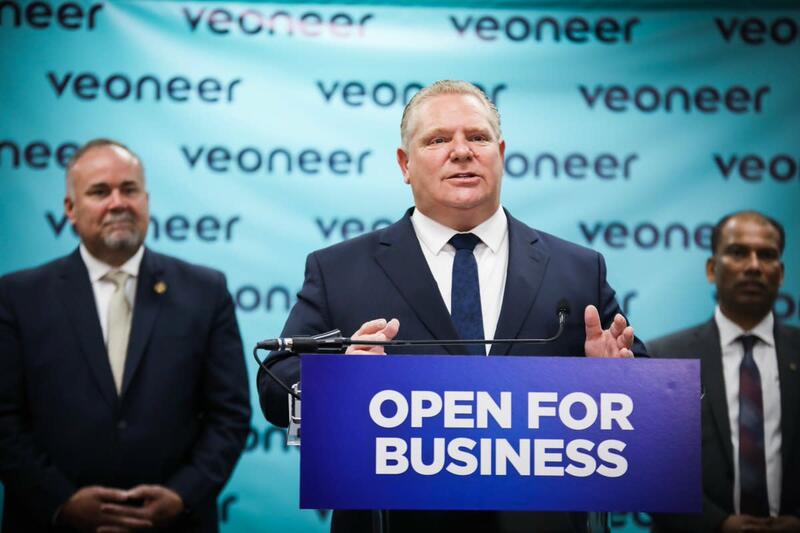 Removing any signs of artificial manufacturing processes will help. Next, grab your 'bud' wire. 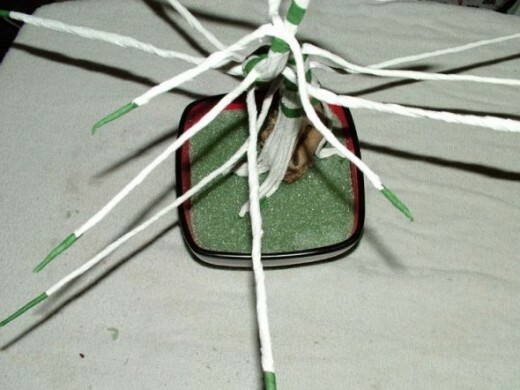 The bud wire comes from the roll of thin florist wire. These usually come in silver or green. I recommend the green (easier to hide mistakes). First cut your wire to the same length as the the thick florist wire. This speeds up the wrapping a LOT. Taking a florist tape whose color is compatible with your bark and greenery, wrap the wire in a similar way as the branches, only keep in mind that all you need to do is cover the wire. Not too thick is recommended, especially if you have to bundle a lot of them together to make an 'end of the branch'. Do not taper them. Next, cut your wire into lengths three to four inches long. You will need one wire for every bud and maybe even leaf, depending on the size of leaf and design of the tree. If you need to wrap more wires, then wrap more wires. it's best to have too many wires wrapped than too few. Now you get to mount your greenery to the wire. In my example, I pushed back some of the tape so the wire protruded from the end. The tape should resemble the back side of a flower. Attach your bud, leaf or whatever in the manner you think best. In my example, the buds from the spray already had a small hole in them. I pushed the wire through the hole from the back, bent the wire with the pair of needle-nose pliers, cut off the excess wire (if any), then pressed the tape up against the base of the bud, taking care to make it look like it belonged there. Depending on what kind of greenery you have, you may need to be more creative to attach your greenery to their twigs. Keep in mind glue tends to weaken over time, but you CAN glue things to the wire once it's wrapped. Just try to keep it looking as 'natural' as possible. Rinse and repeat for as many leaves or buds you have or need. The most ambitious tree I made was 15 branches and 65 buds. When you have the individual buds or leaves mounted on their wires, using the florist tape to completely cover the wires, bundle them together and shape them (more or less) in a natural way so that each bundle will be attached to the end of a branch. A final thought: MAKE YOUR GREENERY NOW. Don't try to make it after you assemble the tree. What you get then is a mess. We almost have a whole tree, but most people would think what we have so far is just yard debris. We have branches and leaves, but we're lacking the trunk and ground. To remedy that, we need to prepare the wood, the styrofoam and the bowl. The simplest way of explaining this step is that the styrofoam should fit snugly into the bowl with about half an inch of the bow's edge above the top of the styrofoam. This is messy, so be prepared for that. Since the styrofoam builds up static cling like locusts on a cornfield, a higher humidity environment is probably better for this. Cut, trim and shape the florist styrofoam so that it fits snugly in the bowl as described. Then, using some of the florist tape, wrap it around the top edge of the foam block and press into the bowl so that the styrofoam stays in the bowl without shifting. Next, cut your wood piece to size and shape. Position it as you imagine it should go, then cut it to size or just press it into the styrofoam the distance it needs to go and position it carefully. Once positioned, use some glue to hold it in place and allow it to dry enough to continue. Depending on your tree design, you may want to drill some holes in the top for placing branch wires, or on the bottom to put pegs to hold it in the styrofoam. Neither is mandatory. The picture above in this section shows a pegged wood piece prepared for placement. Just remember to position it without the pegs before positioning it WITH the pegs. It makes for a simpler build. We have all the parts, now it's a matter of putting it together. This is where your artistic skills will shine. 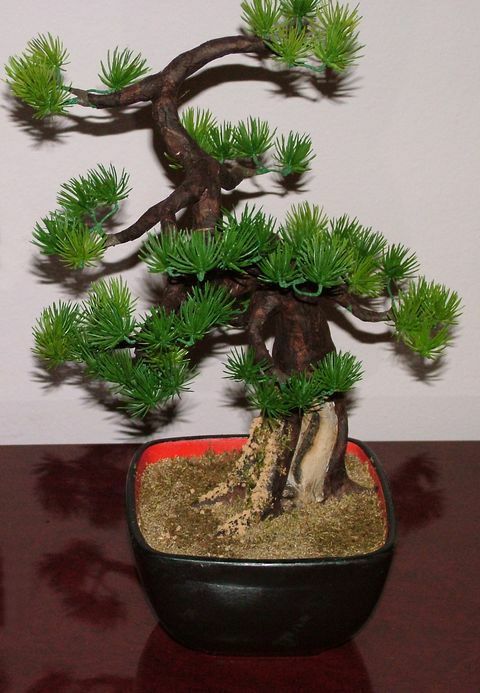 A Bonsai tree is encouraged to grow along certain aesthetic traditions. But in this case all we need is something that looks like a tree. We have the base, the wood and the branches. A young tree has a straight, relatively flat trunk. An old tree has a gnarled, mature appearance. For a bonsai, the more gnarled, the better. In the tree at the top, the branch wires are set into the styrofoam to replicate a wide, surface root system. If you remember how older trees have roots that spread out from the trunk and kind of run along the ground for a few feet before disappearing, you get the idea. You don't just jam the branches into the styrofoam around your piece of wood. You position them very carefully one at a time, taking care to leave some of the wood you so carefully selected, cut and prepared exposed. Spread out the roots as you wish, giving the trunk the ability to be better defined than a flat, boring tree trunk normally is. Put the thick side of the branch wire into the foam, letting the tapered side go toward the top. This gives a bit more thickness to the base and helps create a more natural taper to the overall tree. After generally positioning the branches, using some florist tape, carefully bundle them together, then start bending out the branch forks or groups from the main trunk, and put a little English on the trunk. A traditional Bonsai tree rarely grows straight up. It twists, turns and has a general "S" shape to it, in three dimensions. Be creative, but keep in mind that nature can only be bent so far before it looks artificial. Once you have the basic shape of the tree (don't worry if the 'branches' are too long), go on to the next step. This is where you finalize the shape of the trunk and greenery. It's recommended you do both of these together, but you start at the bottom and work up. Using the modeling clay, fill in the areas around the trunk and roots, shaping things as you go. You don't need to texture them (like trying to make it LOOK like bark), just get the shape right. Again, take your time. You can use a tool to add furrows, buldges or other shapes, but don't make them too small or they'll be lost when you apply the bark. Working from the bottom up, add clay as needed to get the shape right. As you get closer to the branches, you need to start trimming and mounting the greenery. Using the wire cutters, trim the branch to the length you need. Trim the bud bundle you made earlier as well. Lay the bud bundle on top of the branch and, using a length of florist tape, wrap them together securely. If you need to, you can use the wires of the bundle to wrap around the branch (if you thought ahead to do this) for a more secure mounting. Wrap TIGHTLY. It needs to stay in place once positioned. Position the branch and bud bundle as desired, then fill in any gaps or thin areas with clay, making a gentle taper to the branch for a more natural look. Repeat that last instruction with each branch and bundle. You can bundle branches, of course, but each branch should fork off for an individual bundle, or as needed for your design. The clay can be shaped to whatever basic shape you want, so once you're done, you should be looking at something that appears to be a naked tree. This being a g-rated instruction set, we must provide some bark for our naked tree. This is one of the simplest steps, but it's time consuming. First, prepare you glue by adding one part glue to one part water using the small dish. Mix well. It WILL be very thin. This is mandatory. You need something very thin to work your tissue or bark paper. Starting at the bottom, tear small pieces, about an inch wide by an inch tall, from your paper. you CAN cut them into small section, but I've found tearing them creates a more natural seam and adds texture to the tree it would otherwise lack. Next, using the tweezers (to keep your fingers from getting all sticky) soak the piece for a few seconds in the glue, get both sides, and make sure it's pliable. Then, using the brush dipped in glue and manipulating it with your tweezers, apply it to the tree at the desired location. This has to be done to cover all of the tree. At the junction of the branch and the buds, you can thin out the tissue by tearing gently and applying thin layers of thin tissue so that the margins between them aren't too abrupt. You can apply the paper in different directions, or shape them with brushes or other tools somewhat to create design and texturing, folding them a bit, or using a coarse cloth to press into it to create a more 'bark-like' appearance. I started with tissue paper, but went to the bark paper because I found it to create a superior effect. It's basically pounded flat bark to begin with, so applying it to a small tree is only natural. A $10.00 sheet of 15" X 20" will provide enough to make several trees. Failing that, colored tissue paper works as long as you are patient in applying it and texture it appropriately. Moss, moss and more moss. We're almost done, but there are a few critical details we should have. The ground can appear to be anything. Even a mat of moss is acceptable, though that tends to cover up all those exciting roots and other near-ground tree details you created earlier. What I do is take the moss and chop it into relatively small pieces. I use a strainer as I chop, with the finer pieces (used for ground cover) falling through and sift through for the 'detail' pieces. Varying the color of moss by chopping up different kinds is a good idea as well. The thought is variety. Ground isn't all one color. Once you have your moss chopped up, pour some of the glue/water mixture into your bowl and start shaking the moss into it. It gets thick and clumpy and ugly, but as the glue begins to dry, you can start spreading it around better, using the brush and maybe a small, dull putty knife. Cover all of the styrofoam and push up against the tree, taking care not to cover anything you don't want covered. Be sure to fill in around the edges of the styrofoam and bowl, covering the styrofoam completely. You can even add a bit of a lip or depression around the outer edge of the bowl to make it look like the 'dirt' has settled. Finally, taking some more glue on your brush, dab the glue on the tree trunk on the 'south' side. It doesn't matter which side it is, but it's the side most in the dark (usually the opposite of the lee of the tree as a plant will grow toward light). Once well sticky, dab a bit of another color of moss along the edges or crannies to replicate old-growth moss. Not too much, because you don't want to cover up the detail of the tree. And, to be honest, you don't have to put moss on the tree. It's there strictly for visual effect. If you think it looks like a tree without the moss on it, you're done. Now that you know how to make your own Bonsai, try some variations, use your imagination and have fun decorating. They're relatively inexpensive to make and most folks enjoy getting a plant they can't kill that looks good. How great to actually be able to bring up complete instructions without jumping all over the place to find them. And the bonsai looks beautiful. I'm going to try it.